I'm a self confessed, Pinterest addict whether that be scrolling through my phone to see if any new pins on my homepage tickle my pickle or simply to heading off into the vaults of Pinterest to find some inspiration. I have always loved scrapbooking and creating collages, you only have to take a peek at the inspiration wall in my flat to get a feel for the kinds of image collation that I like. I currently have 25 boards on the go ranging from style to antiques. 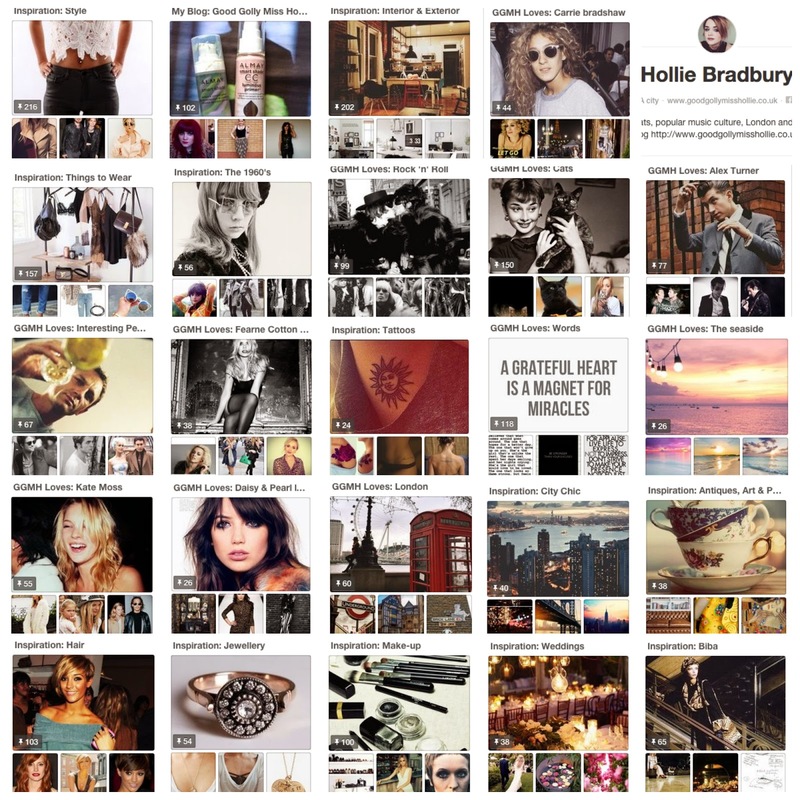 My boards are categorised into 'Inspiration' boards for images that inspire my taste in clothes, hair and make-up alongside 'GGMH Loves' boards which include a range of subject areas such as celebrity icons, cultural movements or places (usually a city) in the world. My favourite collection of images is probably my 'Interesting People' board as it houses a whole host of people who interest me from throughout the decades, Audrey Hepburn, John Lennon, Natalie Massenet and Paula Yates to name a few. The most inspiring board out of my collection is probably my 'Interior + Exterior' board which is essentially a scrapbook of ideas for my dream home however, more realistically as I rent my own flat, I like to take little pieces of inspo to kit out of my own place. The board that I get lost pinning on is my 'Rock 'n' Roll' board on their is an amalgamation of documented cultural and musical movements. Everything from the swinging 60's to the new wave era of the early 1980's. There's archives of influential people of their time such Mick Jagger, Stevie Nicks and Steve Strange and I love to note how fashion changes throughout the years. Pinterest is a great space on the internet to store and share ideas through imagery, afterall it was my 'London' board that helped me to seek out some of the lesser known gems in the capital and my 'Sunshine Wanderlust' board that helped me to find the perfect holiday getaway in Ibiza.